This is a PDF of ‘The Future of the Eurozone’ eceonomic discussion document I authored, commissioned by Matt Carthy MEP and launched in Dublin today. We were joined by Italian author Thomas Fazi and NERI’s Tom Healy. Below is an account of the visit by an international parliamentary delegation of 33 elected representatives and a number of their advisors to Catalonia, hosted by DiploCat, during the Catalan referendum. While the delegation programme lasted for several days, this account covers only Sunday October 1, polling day. I participated in the visit on behalf of Sinn Féin MEP Matt Carthy, who was unable to attend, and was joined by several Sinn Féin colleagues. This is not a political analysis of the Catalan referendum but my personal account of what we witnessed. I left my hotel at 7am on Sunday morning to meet up with the international parliamentary group and our DiploCat hosts. It was still completely dark and pouring rain but I knew thousands of people would have been gathered outside polling stations since 5am to defend them from police attempts to shut them down, which had been rumoured the day before to be scheduled to begin at 5am or 6am. The international visitors were scheduled to leave in 10 small groups from a central meeting point at 7.30am. I was in a group with Sinn Féin Senator Trevor O’Clochartaigh, Swedish Green MEP Bodil Valero, Welsh member of the Westminster Parliament for Plaid Cymru, Hywel Williams, and Magni Arge, a member of the Faroe Islands and Danish Parliaments for the left pro-independence Republic party. We spent the day with our helpful DiploCat host, a young woman called Irina. The official plan was to visit three or four polling stations in Barcelona and the surrounding towns; meet the mayor of Solsona for lunch at 1pm; then return to Barcelona by 4pm. Our first stop was a polling station at a school (Col·legi Orlandai) in the Barcelona suburb of Sarrià-Sant Gervasi, close to Gràcia, where two of the international groups, or around 10 observers altogether, arrived at 8am. It was bright by then and the rain stopped temporarily. Hundreds of people were gathered outside the school, whose entrance gates were closed. They cheered when we arrived, seeing our ‘international observer’ lanyards. Two uniformed members of the Mossos d’Esquadra, the Catalan autonomous police, stood at the edge of the crowd and observed. We started to speak to some of the voters gathered, sometimes in English and sometimes having the conversation translated by Irina or by Bodil from Sweden, who has fluent Catalan. They said the Mossos had earlier informed them they had been instructed to prevent voting, but that they did not intend to, in the interests of protecting public order and public safety. Trevor suggested we speak to the officers. I hesitated for a second, not being a big fan of police, having both experienced and witnessed police violence at peaceful public gatherings and rallies on several occasions. But we went over to introduce ourselves. Both were polite and friendly, and chatted comfortably with us in English. One of them, finding out Trevor and I were Irish, told us he had lived in Dublin for close to a year. I asked if it was okay if I took a photo of them speaking to Trevor and they replied, “Of course it is”. Some of the assembled voters told us the majority of the crowd had been there since 5am, and that the school was one of those that had been occupied since Friday afternoon. The parents of the kids who attended the school had slept inside the school building on the Friday and Saturday nights. There were three or four young women half-asleep on thin mattresses just outside the building, under the shelter of an overhanging roof. People carefully stepped over them, as did we. Just then, at around 8.15am or so, the parents began to exit the school building into the waiting crowd, carrying their mattresses and sleeping bags, to cheers and applause. Some of the organisers then invited us to come inside the school, and we squeezed through the voters to walk through the gate. The front rooms were set up with desks for ballot papers and ballot boxes, and around a dozen volunteers were working intently on computers and laptops. Voting was due to begin at 9am but their electronic electoral system was down and the entire internet seemed to be down too. I tried to get online on my phone when inside the school and couldn’t – sometimes my phone would say ‘No service’ but even when it didn’t, I was still unable to use the internet. I couldn’t get online for hours that morning. It was the same for the other visitors, though some of them seemed to be able to get online for two or three minutes at a time. Outside, one of the organisers called on the voters to all switch their phones onto airplane mode in the vain hope that it was a capacity overload problem, a request everyone quickly and willingly cooperated with. Someone told us the polling station staff were attempting to get online by using a Belgian proxy; it didn’t work though. We heard through text messages that not only the electronic voting system was down, as was expected, but the entire internet was down at a number of other voting stations too. “Do you think it’s the Spanish government that’s responsible?” I asked one of the frazzled volunteers. She looked at me as though I were a moron and said, “Of course it is.” We both had to laugh. The voters outside were patient and cooperative, occasionally breaking into chants of “Votarem! Votarem!” (“We will vote!). We could see each other through the gates; organisers outside communicated constantly with those inside, and passed phones, coffees and mini-pastries through to the volunteers. Bodil did an interview with a Swedish journalist holding a recorder through one of the gaps in the gate. When it rained, the voters shared large umbrellas through the crowd. At one stage an organiser was lifted on top of someone’s shoulders to call on the voters to clear a path for the elderly, people with special needs and people who had to go to work that day to be able to come up to the front and vote first. Two older women were brought into the school building so they could sit down; an elderly, frail man refused the offer of coming inside and continued to stand outside at the front of the queue using his umbrella to help support himself. It was at that point that texts began to come through saying there had been attacks by riot police on other polling stations in Barcelona, including some that were close-by. Shortly before 9am, the two Mossos officers entered the school building, with voters clearing a path for them. They asked the volunteers to assemble so they could speak to them all together. The international visitors hung back but within hearing distance, and Irina and Bodil translated for us. The Mossos informed the workers that the National Police was attempting to close several polling stations in Barcelona. They repeated what they had told us and the voters earlier; that they had been instructed to prevent the vote from proceeding, but that they were not going to, as their intention was to act in the interests of preserving peace, public safety and public order. They added that if the Spanish police arrived, they would not be able to intervene, but that they would try to act as mediators between the Spanish police and organisers. One of the Mossos then approached the seated older women, crouching down to ask if they were feeling okay, and offered them water. Then they left through the gates, to applause. The volunteers resumed working to resolve the internet problem. I remarked to one of them that the voters assembled outside were incredibly patient, waiting for hours in the rain; no-one was acting annoyed or frustrated at the fact that the polling station was still closed at 10.30, an hour and a half after it was scheduled to open. “They have been waiting their whole lives to vote,” she said. “They don’t mind waiting a little longer.” But anxiety about the possibility of a police attack was growing. The polling station workers thought that if they had computers with older technology they may be able to connect to a wifi system – so people outside ran home to bring in two or three old laptops and an old PC, which they passed through the gates. At around 10.40am a cheer went up inside the building and we all started clapping – it had worked! They were connected. One man inside excitedly ran to inform the others, through the gate, that they were connected to the internet and voting was about to begin. “I’m going to be the first to vote!” he yelled excitedly, to laughter. The two elderly women and a handful of others inside took up their ballot papers and voted. Then the gates opened and the first round of people walked through. Everyone was cheering and applauding jubilantly – the voters outside, the workers inside, us international visitors. The faces of those who came through were still calm and resolute but some became tearful after they voted. It was a really moving moment, and it’s hard to accurately put it in words. The best way I can describe it to say there was an overwhelming sense of dignity about both the moment and the people. As the voting got underway, our DiploCat hosts organised the two groups to start moving to our next location; we had been scheduled to leave shortly after 9am but had decided to stay until the station opened. The voters lined up outside the school cheered us and said “Thank you!” in English as we left. We started driving to Manresa, an industrial province of around 75,000 people in the centre of Catalonia, about 45 minutes outside of Barcelona. We had already seen a small number of videos on Twitter of police seizing ballot boxes and beating voters with batons in the brief moments where anyone could connect to the internet in the polling station at Sarrià-Sant Gervasi. Now we spent the journey uploading our own photos, footage and observations from the morning onto social media, and passing around phones between the seats so we could all view the latest footage of the police attacks – gasping, murmuring “Oh my god,” and exclaiming “Jesus Christ!” as the snippets of film from the other polling stations showed increasingly brutal violence and rubber bullets being fired into defenceless and panicking crowds. It was not just the National Police we saw in the footage anymore but also the Guardia Civil. Hywel was uploading live videos in Welsh to Twitter, describing our visit. When we arrived in Manresa centre around 11.30am we stopped for a coffee for a few minutes and stood at the bar with our eyes glued to the TV which was, of course, broadcasting the footage from the polling stations. The building in the square were adorned with colourful flags saying “Sí!” and “Democràcia!”, like in Barcelona, and it had stopped raining entirely. Then we walked to a polling station, a school, where the people queuing outside again cheered as we approached. There were still large crowds waiting to vote as we entered at around noon, and spoke to the polling station workers. The National Police had not arrived at the station; the queues were orderly and the mood bright. Two Mossos stood outside. One of the polling station volunteers offered to walk us around to the second voting station open in Manresa centre, which was nearby, and we agreed. During the walk the volunteer said worriedly to our DiploCat guide, Irina, that the route we were taking to the second site wouldn’t show us the best side of Manresa; Irina translated her concerns while laughing kindly. Relaxing, the local volunteer then joked that we were walking down “Las Ramblas” of Manresa. This station, too, was busy, but calm and orderly, having received no visit from the National Police or Guardia Civil. Each polling station had a ‘president’ – a coordinator or presiding officer. Many of the volunteers were wearing stickers that identified them as both activists of the ANC (National Assembly of Catalonia) and also of ERC (Republican Left of Catalonia). I spoke to the president at this site in English for some time about how the day had unfolded, and he outlined the same difficulties with their voting system and internet access that we had experienced early in the morning. I asked him if he was a member of any political party as I was curious as to whether the volunteers were all affiliated to political parties or whether there were also unaffiliated community members and activists. Almost apologetically, he said he wasn’t a political activist, but worked in IT – and that his mother, an ANC activist, had called him the night before to say they needed people with technological expertise as they anticipated hacking attacks. “So here I am,” he smiled. As we left, the crowd queuing outside applauded and started chanting “Thank you! Thank you!”. By this stage we had asked Irina to teach us how to say “Good luck” in Catalan, so we replied “Bona sort!” as we left. I grinned to hear a man in the queue describe us as “briagdistas internacionales” as we walked past; he and his friends laughed and waved goodbye. Irina told us there were fears of a nearby polling station being attacked so we drove to another school at Sant Joan de Vilatorrada, just a few minutes from Manresa centre. The atmosphere was different here, subdued. People queued outside, but quietly. There was no cheering. Inside, the volunteers told us that the polling station had been attacked violently by the Spanish police that morning, before it had even opened. Witnesses told us that the National Police had used a battering ram to enter, and smashed a man’s finger in the door four times, crushing the bone and severing the tendons. They took the ballot papers, boxes and began attacking the voters outside. A teenage girl explained to us that her and some other voters had run up to the two Mossos present and asked them to do something; they said they couldn’t intervene but called their superior officer who arrived and had a heated argument with his counterpart in the National Police, after which the Spanish police withdrew. The injured man had left hours earlier to get medical attention so we couldn’t speak to him. The organisers and locals were anxiously expecting the National Police to return – they had received encrypted WhatsApp messages from organisers and activists at nearby stations and on nearby roads who reported they had seen around 60 Spanish police officers in the area. The locals knew they didn’t have the numbers to resist another entry attempt by police. We walked up to a perimeter fence that voters and activists had gathered by, all of us peering through warily. An enormous cheer went up as a number of uniformed firefighters walked up the hill together to the school. The firefighters who outlined the situation to us. Photo by Bodil Valero. Then we heard through WhatsApp messages that the Guardia Civil had attacked another polling station just a five-minute walk away. The firefighters sprinted off down the road as a handful of teenage boys sprinted off another way, obviously knowing a short-cut. Irina said we should think carefully about whether we wanted to try to catch up with the police, but we all quickly agreed we did. Our driver zipped us around to the school that was under attack and we arrived to scenes of lines of around 20 Guardia Civil officers jostling voters who had their arms raised. Several Mossos and firefighters formed a line of their own in between the voters and the Guardia Civil. The people were peaceful but angrily chanting, “No passaran!”, “Catalunya! Catalunya!” and seemingly most infuriatingly for the Guardia Civil, “Mossos! Mossos!” After a tense and angry standoff of around 15 minutes, the police backed off and left. We were on the street, and couldn’t see the school building through the crowd, so I misunderstood the situation we had walked into. I thought the Guardia Civil had arrived, realised they were heavily outnumbered, and decided to leave. But that’s not what happened – we had got there too late. They had already smashed down the glass doors of the polling station, seized the ballot boxes and beat a 70-year-old man over the head with a baton – just because he was in the process of voting. As the Guardia Civil left, he was sitting outside being cared for by other voters. We jumped back in the car based on more WhatsApp messages and tried to get to the next site we believed was going to being targeted before the police did, around five minutes away. People were gathered outside anxiously and some were clearly in shock, having arrived from the same polling station we had just come from. I spoke in English to a teenage boy wearing a Nirvana T-shirt and told him we had just come from the school. White-faced and shaking, he said he had been inside the polling station with his grandfather when the Guardia Civil had burst in and started hitting people with batons. Every few words he would almost choke, finding it hard to speak. “I need to go home,” he said after telling us what he saw. I patted him on the shoulder in a gesture that felt painfully inadequate. The firefighter who we had earlier befriended at the first school we had visited in Sant Joan de Vilatorrada came up to us and told us that the organisers had just shut the polling station voluntarily in order to try to prevent an attack. They wanted to protect people from violence and also protect the ballots they had from being seized. It was around 3.30pm. He told us of their standoff with the Guardia Civil and said that like us, the firefighters had arrived too late to do anything to prevent the attack. “But the fact that you guys and the Mossos got there stopped them from beating the voters on the street after they had taken the ballots,” Magni, the Faroese visitor, said. The firefighter wasn’t going to be consoled. “Now they are laughing at us,” he said, meaning it both literally – the Guardia Civil had taunted and laughed at them during the stand-off – and figuratively, as in, they had left with people’s votes. He said the words with such a sense of powerlessness and humiliation that, for me, it was the lowest point of all that we observed that day. As people began to disperse after the closure of the polling station we got back in the car; one of the volunteers had suggested we could drive to the local Spanish police station to see it, perhaps to try to speak with some of the officers. A number of roads were closed, though, so we couldn’t get there. We saw one of the empty roads closed off by Guardia Civil vehicles and Hywel wanted to go and speak to them and take photos. I told the others that our phones might be confiscated if we tried to take photos because of the (2015) Spanish gag law that, among many other restrictions, banned taking photos of police officers. We all left our phones in the car and walked down to around eight officers who were blocking the road with large vehicles. Bodil translated our questions for them and their responses. She asked why the road was blocked; they replied that it was because someone had been taking photos of the police, which was illegal. “Because of the gag law,” Bodil replied, provoking protest at the phrase. They said they were “just doing their job”, but then moved one of their vehicles to clear the blockade of the road. We weren’t going that way anyway, so, to the confusion of the Guardia Civil, drove off in the opposite direction. We had been due to have lunch with the mayor of the town of Solsona at 1pm and were now at least three hours late. Irina insisted that we had to eat something, so we set off further inland to Solsona, another 45 minutes or so away, though I think it’s safe to say all of us had lost our appetites. Back in the car we took turns charging our phones, and passed around the phones in use to see the latest images and footage of attacks at the polling stations. Hywel delightedly informed us that his press officer told him he was trending on Twitter in Wales due to the updates and images he had been sharing all day, which lifted our spirits a little. We arrived at the main polling station in Solsona, a town of around 9,000 people in the province of Lleida, at close to 5pm. The mayor, David Rodríguez, and others came out to welcome us. As well as being the mayor of Solsona, David is also a member of the Catalan Parliament for the ERC, the Republican Left of Catalonia. The polling station was striking for how well organised it was. Two massive tractors formed the main part of a barricade at the entrance of the centre, and another tractor blocked off a smaller way in on the footpath. You could still enter, but only on foot. There were very large crowds of people gathered on a grassy area outside of the building in a sort of festival atmosphere with some music and tents, and several firefighters, who got an enthusiastic round of applause every time they waked from one place to another. The polling station itself was a large gymnasium-style building. The volunteers inside were on edge and were expecting police to arrive shortly. They were preparing to shut down the station and hide the ballot boxes at the first sign of a raid. He explained to me that they believed there were enough hiding places in the building that they could temporarily hide the ballot boxes if the police managed to enter. They had taken the step of stuffing two ballot boxes with empty envelopes and “hiding” them in an easy-to-find spot. I laughed at the ingenuity. Everywhere we had visited, people were dealing with the problems they faced collectively, with great creativity and even with humour. David asked us to come and have lunch at a Japanese restaurant, a couple of minutes’ walk away. We were reluctant to leave as people were expecting the arrival of the Guardia Civil, but he assured us we would all return immediately if we heard any reports of their arrival. He introduced us to the owner of the restaurant, who greeted us warmly and told us he had moved from Japan to Solsona 27 years ago. Then for 30 rather surreal minutes we ate sushi and talked across the table, finishing with more coffee. The owner’s son, around seven years old and playing outside in an FC Barcelona jersey, kept running up to the window to wave excitedly at us. We grinned and waved back. David led us back in to the polling station and on the way back I spoke to a young woman who was shortly due to sit examinations to become a judge. She thought there was a good chance that her role in assisting the local referendum process would destroy her chances of becoming a judge, and said that one of her fellow students was too scared to even vote for the same reason. “But it’s worth it,” she said. Having done countless all-nighters for law exams myself I was left in awe. David told us the organisers were still on stand-by to shut down the polling station. One of our group remarked to him that it must be a difficult decision – to close the polling station early before everyone had had the chance to vote. We were scheduled to meet with the rest of the international delegation at 8.30pm to prepare a joint statement about the conditions in which the referendum was held, and both Magni and Bodil needed to get back to Barcelona to do media interviews before that time, so we began the drive back. Irina asked the rest of us if we wanted to take a break or visit another voting site, and Trevor suggested we go to the Josep-Maria Jujol school in central Barcelona – which both of us had visited during the occupation the day earlier. Trevor had also visited it at around 6am that morning and wanted to see how they had survived the day. There was a huge number of people gathered outside the school, possibly a couple of thousand, and they cheered loudly when we entered. “Gracias, bona sort!” we called back. It was around 7.30pm and they had been undisturbed all day – in my view, because they had the numbers required to deter any police intervention. Excitement was rising that they would manage to make it to 8pm, the end of voting time, without a police attack. Two Mossos walked around the entrance and they too were cheered. A political scientist who taught at one of the Barcelona universities was the president of the polling station and showed us how they had been dealing with the technological problems in order to ensure the highest electoral standards were maintained. Inside the polling station I ran into a number of Basque friends who were visiting Barcelona in a show of solidarity. I joked darkly to them that they must have felt the same way right then as Irish republicans did when the DUP formed a coalition with the British Conservatives earlier this year – for a brief moment the world’s media attention shone a light on problems and outrageous behaviour that we struggle constantly to draw attention to. Of course this was on an even bigger scale. They laughed in grim agreement. The author Liz Castro was also at the school, and interviewed Trevol, Hywel and I about what we had observed as we waited for 8pm. She tried to broadcast it live on Twitter’s Periscope feature, but the internet was too patchy, so she filmed it to upload later instead. At about 7.59pm a rumour spread through the building that the police were coming to seize the ballot boxes, causing a brief moment of panic. A minute later we were assured by the tense polling station president that the rumour was false. Inside, photographers and media camera crews filmed the two young electoral officers who began the official count of the ballots. I asked the volunteers if they had heard of any plans for mobilisations in Barcelona that evening, saying we had heard that there would be demonstrations in several cities in the Spanish state against police brutality. As we left to get to our meeting with the rest of the international delegation, we walked out behind the electoral workers. The people who had defended the polling station all day – and all weekend in fact, for many – again applauded us. You guys are the ones who deserve the applause, we kept saying as we shook their hands. I don’t think I’ve ever made such an understatement in my life. Sinn Féin representatives have warmly welcomed the release of Basque pro-independence leader Arnaldo Otegi from prison in Logroño this morning after six and a half years. Otegi’s release has also been welcomed by Spanish left parties Podemos and Izquierda Unida, as well as Catalan pro-independence forces Popular Unity Candidacy (CUP) and Esquerra Republicana de Catalunya (ERC). Pat Sheehan, Sinn Féin MLA, said that the release of Otegi is an opportunity to advance the peace process in the Basque country. “Arnaldo Otegi was one of the main architects of the peace strategy developed by the Basque pro-independence movement and should never have been imprisoned,” he said. MEP Martina Anderson added her congratulations, saying: “I am delighted that today Arnaldo Otegi is being welcomed home by his family and community, and I send warm congratulations to him from Sinn Féin. “We also welcome the news that Arnaldo Otegi has confirmed he will take part in internal party elections later this month seeking to stand as a candidate for EH Bildu. Since the 1990s, Arnaldo Otegi has been acknowledged as the leader of the Basque pro-independence political movement – and he has also faced unrelenting political persecution by Spanish authorities. Already the Spanish authorities have sought to restrict rallies welcoming Otegi’s release from prison. Among the political charges that have been brought against him include being sentenced to jail in 2006 for participating in a commemoration marking the murder of an ETA leader by a Spanish death squad in 1978, and being jailed again in 2010 for comparing a long-term ETA prisoner to Nelson Mandela. In 2005 Otegi was sentenced for ‘insulting the king’ after he commented at a press conference held on the torture of Basque journalists that the King bore ultimate responsibility for this torture as the official head of the armed forces. In March 2011, the European Court of Human Rights ruled that Spain had infringed Otegi’s right to freedom of expression in this case. In October 2009, 10 central leaders of the Basque pro-independence movement including Otegi were arrested as they met to discuss a new peace initiative, and five of them were jailed. Despite such provocation, this peace initiative has led to the permanent ETA ceasefire of 2011 and its move in 2014 to begin the process of disarmament. It has also led to the legal registration of new pro-independence party Sortu in 2013, which has rejected violence and reached unprecedented levels of popular support in the Basque Country. Martina Anderson spoke at the launch last March of the international campaign to free Otegi, which was endorsed by several former Latin American presidents, and Nobel Prize winner Nobel Peace Prize winners Desmond Tutu, Adolfo Pérez Esquivel, among many others. “As well as being acknowledged as the leader of the Basque pro-independence movement, Otegi is also indisputably the leader of the Basque peace process, and that is why he was jailed in 2011,” she said. Sinn Féin Vice President Mary Lou McDonald TD and MP for Mid-Ulster Francie Molloy carried out a national speaking tour of Australia from August 30 – September 9 2014 to promote the Australian Uniting Ireland Campaign. The two Sinn Féin representatives were accompanied on the tour by Cairde Sinn Féin’s Emma Clancy, and they visited Perth, Sydney, Canberra, Melbourne and Brisbane to meet with the Irish community, labour movement activists and leaders, and academics. 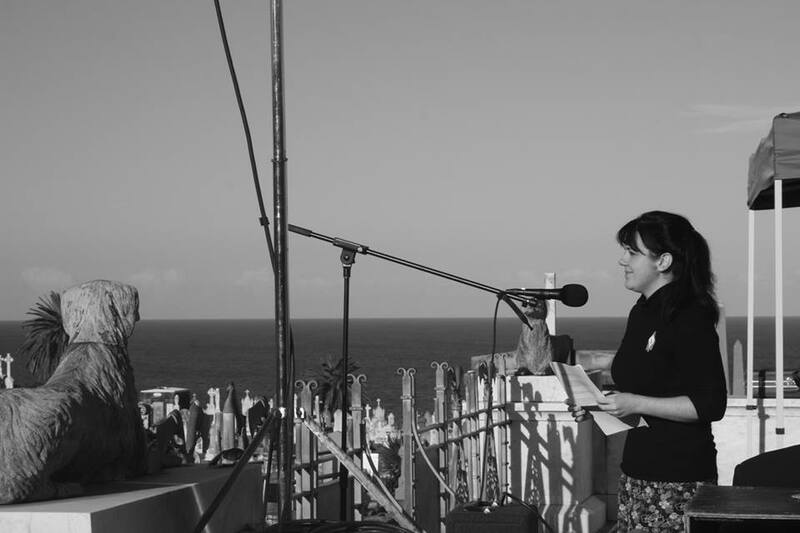 At a series of public events they addressed more than 1,000 members of the Irish community in Australia. They also met with dozens of Australian political representatives from the Australian Labor Party, the Greens, the Nationals, and the Liberal Party from across the country. The Sinn Féin representatives outlined the role of the diaspora and Australian labour and political forces in supporting the international campaign for a referendum on Irish reunification. Molloy and McDonald also raised issues faced by the local Irish emigrant community with political representatives, including the campaign against unaffordable school fees for the children of skilled migrants working in Australia on the 457 visa (which affects Western Australia, New South Wales and the Australian Capital Territory). Another goal of the tour was to raise awareness among Irish workers in Australia of their workplace rights and entitlements. During the tour, the Sinn Féin representatives spoke with several Australian MPs and senators in the state and federal parliaments, including federal Shadow Minister for Workplace Relations Brendan O’Connor and Education Minister in the Australian Capital Territory government Joy Burch. A political briefing was held in the Federal, New South Wales and Victorian parliaments. In New South Wales, they met with Labor leader in the NSW Parliament John Robertson as well as Shadow Attorney General and long-time Irish solidarity supporter Paul Lynch, and several MPs. In Western Australia they met with Parliamentary Secretary Vince Catania, while in Victoria they met with a group of MPs including the President of the state Legislative Council Bruce Atkinson at a briefing hosted by MP Bronwyn Halfpenny. The federal parliamentary briefing was hosted by Senator Gavin Marshall. Altogether they met with 38 MPs and senators across Australia, many of whom had already signed up to the Australian Irish Unity Motion or did so during the tour. Other highlights of the speaking tour included meeting with Aboriginal activists in Perth and Sydney; visiting the Global Irish Studies Centre at the University of New South Wales; a meeting of women trade unionists with McDonald in Sydney; Molloy meeting with the Australian Tamil Congress; and McDonald addressing a rally against austerity in Perth. The tour was warmly received by the Australian trade union movement, whice supported and hosted several of the events. McDonald and Molloy met with Australian Congress of Trade Unions President Ged Kearney in Melbourne, as well as Construction, Forestry, Mining and Energy Union (CFMEU) national leaders Dave Noonan and Tony Maher and Maritime Union of Australia assistant national secretary Mick Doleman at a union-hosted event in Sydney on September 2. They also met with several state leaders of the CFMEU including Brian Parker and Mick Buchan, as well as leaders and activists from many other unions throughout the tour. As well as building links of solidarity between progressive forces in Ireland and Australia with the trade unionists, the Sinn Féin representatives also discussed developing joint efforts to combat the exploitation of Irish workers in Australia on temporary visas and to promote union membership among Irish workers as part of this. 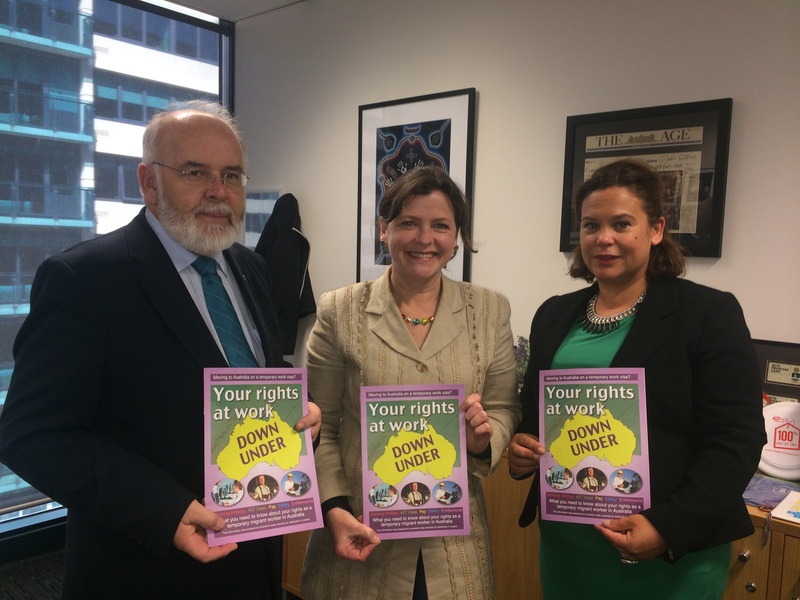 Following the speaking tour of Australia by Pearse Doherty TD in 2012, Cairde Sinn Féin worked with Australian and Irish unions to produce a ‘Know Your Rights at Work Down Under’ pamphlet which McDonald and Molloy continued to promote among Irish workers during this tour. The speaking tour was organised by Cairde Sinn Féin Australia and supported by the Casement Group Melbourne, the Brehon Law Society and the Irish National Association. For full details of the tour, and to download the ‘Know Your Rights at Work Down Under’ pamphlet, visit cairdesinnfein.com. For a full list of signatories to the Australian Irish Unity Motion visit irishunity.org. I’d like to begin by acknowledging the traditional owners of the land we’re meeting on today, the Gadigal people of the Eora nation, and pay my respects to their elders past and present. It’s only fitting as we meet to commemorate a rising against injustices perpetrated by British colonial power that we remember the devastating consequences of this same power on the Aboriginal peoples of Australia. I want to thank the Irish National Association for inviting me to speak today. I want to thank them too for the enormous amount of effort they have put in over many decades to maintain this monument in honour of Michael Dwyer, and all those who fought for full independence and equality in the 1798 rebellion. 1798 marked the birth of the modern Irish republican movement. Michael Dwyer, who remains were brought here in 1898, was a leader of the United Irishmen during the 1798 rebellion. He was 26 when the rebellion began, and after fighting in Wexford, he led a guerrilla campaign against British forces from the Wicklow mountains for more than five years before being transported to Australia with his wife in 1806. Sydney’s Irish community built this remarkable monument in 1898, on the centenary of the United Irish rebellion. Now we are fast approaching another centenary – that of the Easter Rising, which we commemorate today. Republicans across Ireland and around the world are gathering this weekend to remember those who gave their lives in pursuit of Irish freedom in 1916. This year is the 98th anniversary of the Rising. In 1916, Dublin was the city that fought an empire. On Easter Monday, 1200 men and women set out to bring an end to British rule in Ireland during the First World War – in their words, to “strike a blow for freedom”. The leaders, including the seven signatories to the Proclamation, were all executed by the British in the weeks that followed. The nationalist women’s organisation Cumann na mBan, founded 100 years ago this year, created the Easter lily in 1925 as a tribute to all those who died in the struggle for independence from British rule. Wearing Easter lilies to honour Ireland’s patriot dead today, we make no distinction between those who died in 1916 and those who died in 1981. We honour equally the Republican men and women who fell in the years of struggle from 1916 to 1923 and those who gave their lives in the recent conflict that broke out in 1969. And we remember not only the individuals who led the Easter Rising, but also their vision and the ideals they died for. These ideals were best articulated by James Connolly, Pádaric Pearse and the other signatories of the Proclamation of the Irish Republic – of national sovereignty, equality, social justice, and democratic rights for all. The fact that almost 100 years later we are meeting here today to remember the Rising, halfway across the world in Sydney, is testament to the impact that the vision and action of the men and women of 1916 has had. Last year marked the beginning of a decade of centenaries of pivotal events in Ireland’s struggle for independence. Last year we marked the Centenary of the Great Lockout of 1913 when the bosses of Dublin declared war on the workers and their families. The choice presented to the workers was stark. They could obey the bosses, resign from their union and go back to their tenement slums and their poverty with their heads down. Or they could resist. Thousands chose resistance. Through the summer and autumn and winter of 1913 and 1914 they faced police brutality, press vilification, Church condemnation and starvation. They seemed defeated but out of their struggle arose a revived trade union movement and a proud working class. Again and again, in the decades since the Lockout, those whom Wolfe Tone called the people of no property were offered that same choice – resign or resist. They were told to resign themselves to their fate when Ireland was partitioned and a sectarian Orange state established in the Six Counties. But the followers of Tone and Connolly refused again resisted, and stood by the Proclamation of the Republic. Half a century after the Proclamation, the Civil Rights movement stepped forward and was met with the same choice – resign yourselves to the reality of this one-party sectarian state or resist. They chose resistance. RUC brutality was resisted. Internment was resisted. The British Army was resisted. Criminalisation in the H-Blocks and Armagh was resisted. Collusion and censorship and the demonization of whole communities were resisted. They could not defeat a risen people. But as we know, the struggle isn’t over. Republicans had always made clear that if a peaceful and democratic path of struggle towards our objectives was opened up then we were morally and politically obliged to take that path. The peace process opened that new way forward and the IRA, with the same courage they showed during every phase of the struggle, endorsed that new strategy, that new road to our objectives, and set aside armed actions for good. The peace process must be built upon and this is a work in progress. While the North in particular has been transformed for the better in recent years, the scourge of sectarianism remains. The past threatens to trip up the future. Overcoming sectarianism and taking steps towards reconciliation involves reaching out to the unionist community. A real reconciliation process is essential in order to create trust between unionists and nationalists and between both parts of Ireland. Those of you who follow Irish politics closely would know it is over three months now since Dr Richard Haass and Professor Meghan O’Sullivan presented compromise proposals to deal with the outstanding issues of flags, parades and the past. Political unionism has either rejected the Haass proposals or prevaricated. The negative approach of the British government has facilitated this. The British have walked away from their commitments under the Good Friday and subsequent Agreements and this is having the effect of emboldening intransigent unionism. The Irish Government has already agreed that Haass represents the best way forward. But to achieve progress on implementation of the Haass proposals requires the British Government to take up a clear and unambiguous position in support of Haass. There is currently an effort on the part of political unionism to roll back on the progress that has been made since the Good Friday Agreement was achieved 16 years ago. This cannot be allowed to happen. There remain many outstanding justice and legacy issues in the North that need to be addressed. These include ongoing struggles over truth recovery, and ensuring there is transparency, accountability and a rights-based approach to policing and justice. Republicans in Ireland are engaged in political struggles over these issues every day. We here in Australia can play our part in bringing pressure to bear on the British and Irish governments to fulfil their obligations under the Good Friday and other Agreements. Irish republicans in Australia have added to international pressure to defend the rights of republican communities in the North in the past. During the 1981 hunger strike, the Diaspora mobilised around the world in support of the prisoners’ rights, including here in Australia. Thousands marched through the streets of Australian cities. After Bobby Sands died on hunger strike, shipworkers in Wollongong refused to handle British ships coming through the port in protest. Support like this is very much appreciated from those in Ireland. The Proclamation of 1916 continues to enthuse and motivate Irish republicans struggling for reunification, and for equality. Its message of freedom, and of cherishing all the children of the nation equally, is as relevant today as it was then. Before his execution in 1916, James Connolly predicted that the Partition of Ireland would lead to a carnival of reaction. And so it did. Partition created two reactionary states in Ireland, which the conservative political, church and business elites shaped to protect their self-interests. The southern Irish state of today is not a place where the principles of the Proclamation have been lived up to. Far from it. It is, on the contrary, a state in which a corrupt political elite has brought the economy to its knees in order to prop up and pay their equally corrupt allies in the Irish banking sector. It is not a state of equal opportunities for all citizens; it is instead a state of brown envelopes and golden circles. Irish people North and South have faced a considerable period of economic hardship. Hundreds of thousands are unemployed. Many more are struggling to survive. Highly educated, intelligent young people are leaving the country as emigration continues to be used by the Irish Government as a safety valve. Many of them are arriving here in Australia. The Irish people have been forced to witness the spectacle of an Irish government acting as a mere agent for the EU and IMF in Ireland. The enforced austerity by the Fine Gael/Labour coalition in Dublin and the Tory-led coalition in London is the antithesis of everything the Rising and Proclamation envisaged. To stand for the ideals of 1916, must mean standing against austerity; and standing up for the vulnerable, those unable to care for themselves, and the working poor, north and south. There is no middle way between the inequality driven by British and Irish conservatives, and the egalitarian values of our Proclamation. The Irish people have once again been faced with the choice of resigning to vicious austerity or resisting. We can take heart in the fact that people are standing up and fighting back. Republican ideas and politics have more popular support today than they have for almost 100 years. More and more people are getting involved in a new political struggle for the Irish people to be able to determine their own affairs and have ownership of the country’s resources. Young people are increasingly getting involved in the struggle for this New Republic, including taking up challenging leadership roles across Ireland and making republican politics relevant to a new generation. They are guided by the principles of the 1916 Proclamation of the Irish Republic and putting forward realistic alternative policies based on that vision. Today, the mobilisation of the diaspora in support of Irish unity is a central part of Sinn Féin’s strategy for reunification. In recent years we launched the Uniting Ireland campaign – a broad national and international campaign to build political support for Irish reunification through a border poll. Large and successful conferences have been held on this theme in the US, Canada and Britain. This year this important campaign is being launched in Australia, and we urge all republicans in Australia to support it. We’re delighted to be able to announce that Sinn Féin Vp MLM will be visiting Australia to support this campaign in September this year. In the lead-up to the Centenary events to commemorate the Easter Rising in 2016, we also urge republicans in Australia and around the world to ensure a renewed focus is placed on Easter events in the coming years. The INA, Cairde Sinn Féin Australia, together with others, are now initiating planning for nationally coordinated Easter commemorations across the country in 2016. The launch of the Uniting Ireland campaign in Australia, and the momentum that will gather in the lead-up to 2016, provide an important opportunity for republicans in Australia to play their part in the struggle for Irish unity. Bobby Sands once said: “Everyone, republican or otherwise, has their own particular role to play.” Each of us can contribute to achieving the historic task set by the men and women of 1916 – a united Ireland and a New Republic. The economic crisis in Ireland is of such magnitude that it dominates everybody’s lives. In the 26 Counties, there are now more than 450,000 people out of work and the unemployment rate has reached 14.6%. The collapse of the building industry has left more than 100,000 construction workers jobless. Youth unemployment has trebled since 2008. The Irish Congress of Trade Unions recently stated that one in three men under the age of 25 is unable to find work. These figures are actually masked by the soaring level of emigration from this state, with 70,000 Irish citizens now emigrating each year. Rural Ireland and the west of the country have been hardest hit. An entire generation of young people have been driven overseas in scenes reminiscent of the 1950s and 1980s. In County Leitrim, half of those between the ages of 22 and 26 have left. Earlier this year, Fine Gael Government Minister Michael Noonan added insult to injury by claiming that emigration from Ireland was a “lifestyle choice”. Forced emigration is not a lifestyle choice. It is an indictment of the failure of this government, and the previous Fianna Fáil-led government, to implement a growth agenda that can create and retain jobs. The fact is that the Fine Gael//Labour Party Coalition Government is happy to see emigration soar because it acts as a pressure valve for them in a situation where they have utterly failed to introduce an effective job-creation strategy. Together with Britain and Canada, one of the main destinations for Irish citizens is Australia. The Australian economy is performing better than any other in the developed world – due in part to a resources boom but also because the Australian Government responded to the global financial crisis of 2008 with an effective stimulus programme instead of austerity. In the past four years, tens of thousands of Irish citizens have emigrated to Australia in search of work. Most Irish workers are employed in the construction, mining, healthcare and hospitality industries. They are in Australia on two main types of visas: Working Holiday visas and Temporary Skilled Worker visas (‘457 visas’). Working Holiday visas are granted to people aged between 18 and 30 for one year, and can be extended for a second year if the person meets certain requirements. 457 visas are granted to a skilled worker and his or her dependents for up to four years by employer sponsorship, and may be converted to permanent residency if the employer supports the visa-holder’s application. Australian Government figures show that in the past year there was a 70% rise in the number of 457 visas granted to Irish citizens on the previous year. Between July 2011 and April this year, more than 8,000 457 visas were granted to Irish nationals, with about a quarter of these in the construction and mining sectors. Ireland is now the third-largest source of temporary skilled migrants through the 457 programme. More than 22,000 Working Holiday visas were also granted to Irish citizens in 2011, almost double the number granted the previous year. There is evidence that some Irish workers are being exploited in the workplace in Australia as they are dependent on their employer for their visa to be maintained, extended and possibly converted to permanent residency. Any workers beholden to their employer for their residency rights are naturally going to be vulnerable to exploitation and reluctant to speak up if their rights are being abused. Australian trade unions have dubbed 457 workers ‘bonded labour’. There are parallels between the way migrant workers are used in Australia with the way agency workers and posted workers have been abused in Ireland and across the EU. As we know from our own experience, the creation of a group of second-class workers can be used by unscrupulous employers to lower wages, conditions and rights across the board. In Ireland, Sinn Féin has called for a Government-led job creation strategy and outlined our plan for a 13billion euro stimulus programme that could create 130,000 jobs over three years, based on existing sources of funds available to the Government. We want to see a fundamental shift from an austerity agenda to a growth agenda so that young Irish citizens have a future in their own country. And the last thing we want to see is Irish workers being underpaid and exploited in a country they have been forced to emigrate to. Issues facing Irish workers in Australia include underpayment; the denial of entitlements such as leave and workers’ compensation; and diminished safety standards on sites where migrant workers are concentrated. In the past, workers employed under the 457 visa programme were only entitled to be paid a minimum salary. The Australian trade union movement campaigned for guest workers to be paid at the market rate, and in 2008 the Australian Government legislated for this right. Now employers are legally bound to ensure that 457 workers receive the same pay and conditions as Australian workers or permanent residents in the same workplace. There is mounting evidence gathered by the trade unions that employers continue to pay 457 visa workers less – in some cases dramatically less – than the going rate. The reasons why temporary workers are vulnerable to exploitation and underpayment were investigated and documented in the 2008 Government-commissioned Deegan Review of the 457 visa system, which pointed to the high degree of power employers wield over guest workers in relation to their residency rights. ‘Sham contracting’ occurs when a company tells a worker to obtain an Australian Business Number (ABN) and then signs them up as an ‘independent contractor’ instead of as an employee. Companies use this practice to evade their responsibilities to their employees and deny them their proper rights and entitlements. While in reality the worker is an employee of a company, the ABN system allows the employer to avoid paying leave, overtime and redundancy payments, and workers’ compensation insurance. This is another way of driving down pay and conditions across the board, and temporary workers are especially vulnerable to this practice, which in addition to underpaying these workers provides them with no recourse whatsoever if injured in the work place. Trade unions have noted that there are a large number of Irish workers on both types of visa in this situation, even though 457 visa-holders are not actually legally entitled to work under the ABN system. The threat of withdrawing sponsorship forces many Irish workers into sham contracting arrangements in which they are being denied their basic entitlements. Construction and mining, together with road transport, are the most dangerous industries in Australia. In the construction industry, on average one worker a week loses their life on site. Figures have shown that restrictions on the right of unions to enter sites for safety reasons between 2004 and 2009 resulted in a corresponding rise in workplace accidents, injuries and deaths in the industry. The fact is that union sites are safer sites. Irish workers and other migrant workers in the construction sector are concentrated in non-union sites and have low rates of union membership. Trade unions have pointed out that this low level of union membership among migrant workers is at least partially related to the nature of the visa system and the power relationship between the employer and worker. The economic crisis in Ireland is set to continue, and emigration is likely to continue to rise over the next number of years. There are also moves in Australia to expand mass temporary migration schemes, called Enterprise Migration Agreements, using 457 visa workers, as well as moves to reduce the skill level required to gain a 457 visa under these schemes. As the temporary worker programmes expand they will attract more Irish citizens to Australia. 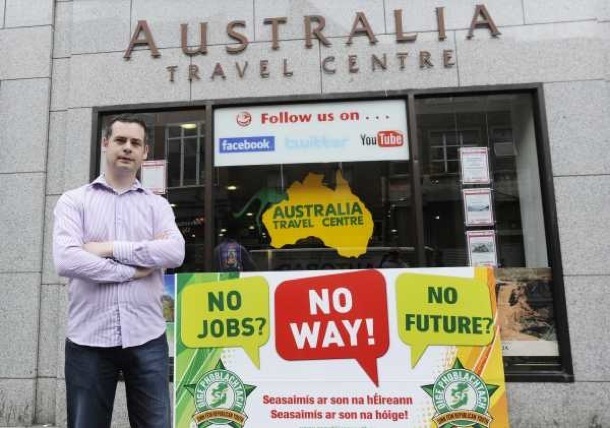 Sinn Féin TD Pearse Doherty, due to visit Australia in September 2012, told An Phoblacht: “Sinn Féin encourages every Irish worker in Australia, and all those planning to emigrate here, to make sure their rights at work are protected. The best way to do this is to join the union as soon as they arrive in the country. “Trade unions can provide protection against underpayment, denial of entitlements, unsafe conditions, and threats of deportation by an employer. “Australian trade unions are campaigning against the abuse of the migrant worker system by employers, and in favour of equal rights, conditions and protections for migrant workers. They are right to do so. “Sinn Féin has consistently defended the rights of agency workers in Ireland and Europe and demanded equal rights for all workers in order to stop the ‘race to the bottom’ on wages and conditions. Just as we, together with the Irish trade union movement, have campaigned for legislation to combat the exploitation of agency workers in Ireland, Australian trade unionists are trying to prevent the creation of a group of second-class workers. “The existing protections for temporary workers have only been achieved by union campaigns for equality. “The trade union movement has made an enormous contribution to improving the lives and wellbeing of working people in Australia, and the Irish community has played a vital role in building and leading that movement. Know Your Rights: Download a pamphlet prepared for Irish workers in Australia here.